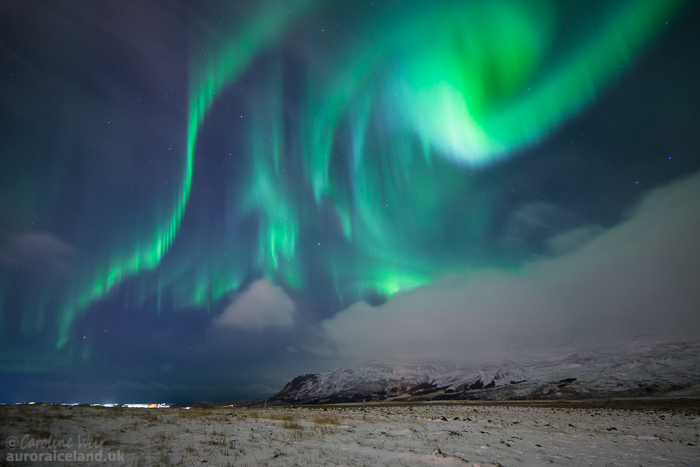 Aurora Iceland – How to see the northern lights in Iceland- Examples of different forms, structures and colours of the aurora borealis. What do the northern lights (aurora borealis) look like? The northern lights can appear in many different forms. Some of these are listed in classification guides such as that of the British Astronomical Association. However, in practice, most of the types of aurora are not discrete entities. Rather, they transition into each other (sometimes rapidly), there are many intermediates, and more than form may be present simultaneously. A key limitation with describing different aurora types is that some of the variation in perceived appearance arises simply as the result of the aurora changing in intensity and position relative to the observers’ own location, rather than due an actual change in structure. Therefore, the same aurora could potentially appear as a rayed arc low in the northern sky for mid-latitude aurora watchers, and as overhead rayed bands, striated aurora, and corona to higher-latitude aurora-watchers. 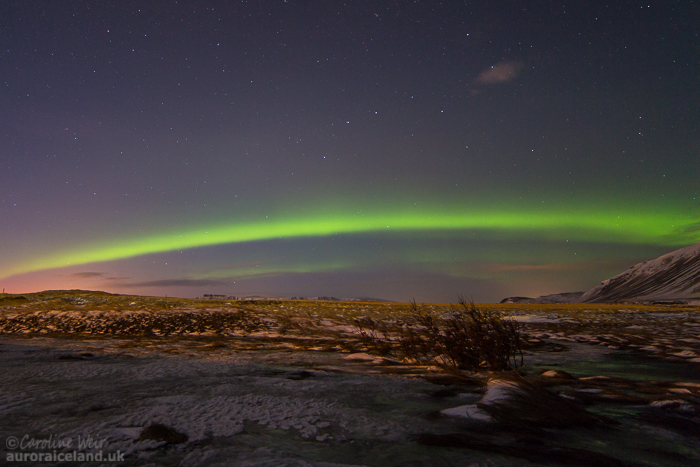 Here I provide some examples of the main types of aurora that I have observed in Iceland. These images are intended only to illustrate the wide varieties of movement, structure, form, brightness and colour that can occur. I acknowledge that intermediate forms (such as homogeneous patches) occur for most of these. 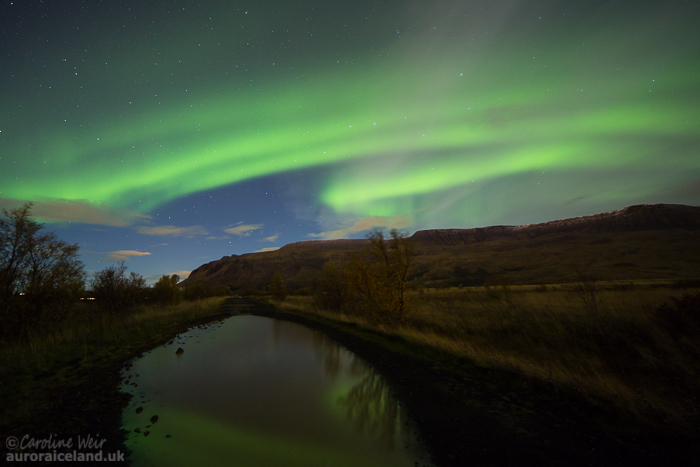 If you wish to find out more about how to see and photograph the aurora for yourself then please see practical advice on how to see the northern lights in Iceland and how to photograph the northern lights in Iceland. I refer to an aurora "glow" when there is a structured aurora in progress but it is located beyond the horizon or line of sight. 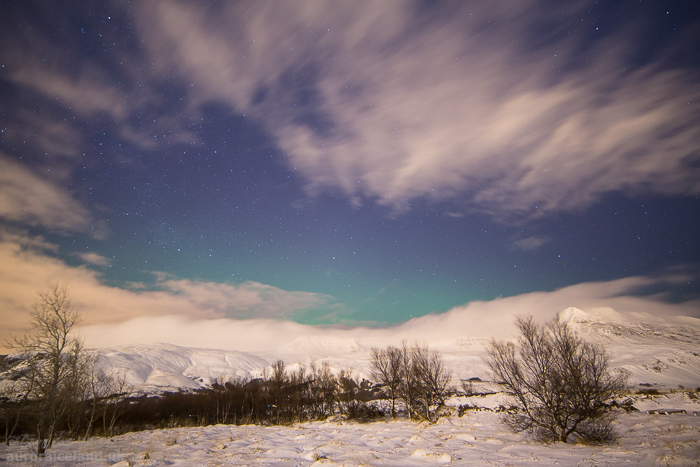 For example, a glow can occur along the tops of mountain ranges, when the main aurora is low in the sky and hidden from view behind the land. It is generally a uniform area of pale (white or pale green) light to the eye, but can appear quite vivid green on camera. Aurora glow coming over the top of a mountain range. The aurora itself is low down in the sky, behind the mountains. 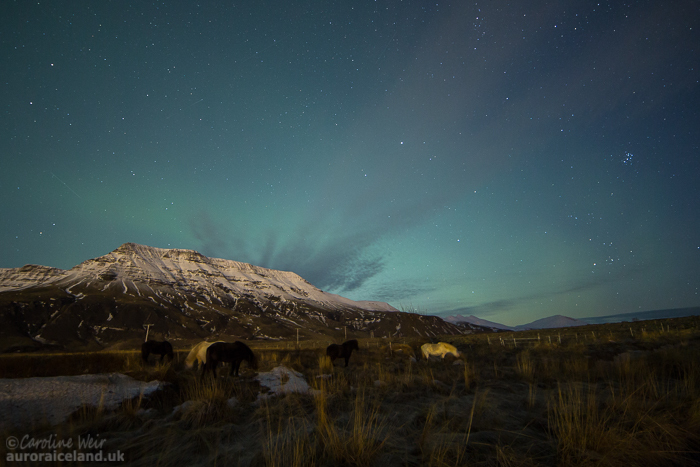 Bright glow from some aurora behind the mountains, and some more diffuse aurora higher in the sky. This is a uniform band of aurora that lacks any rayed structures and usually has distinct, well-defined upper and lower boundaries. It can appear as a "rainbow" type arc of aurora extending east-west across the sky, or as an irregular-shaped band as "ribbons." The arcs tend to shift slowly northwards or southwards over time (not obviously to the eye), while the bands may have slightly faster movement with the ribbon curves repositioning over time. Usually, auroras with arc-like structures are located at considerable distance from the observer, and are likely to be a form linked to perspective (i.e. transitioning into other forms such as rayed arcs or striated aurora as they shift closer to an observer). Consistent with this, arcs and uniform ribbons are most often perceived to be either white (when weak) or shades of green (from pale to very vivid) to the naked eye and do not usually have other colours. A homogeneous 'rainbow like'arc of aurora in the northern sky. 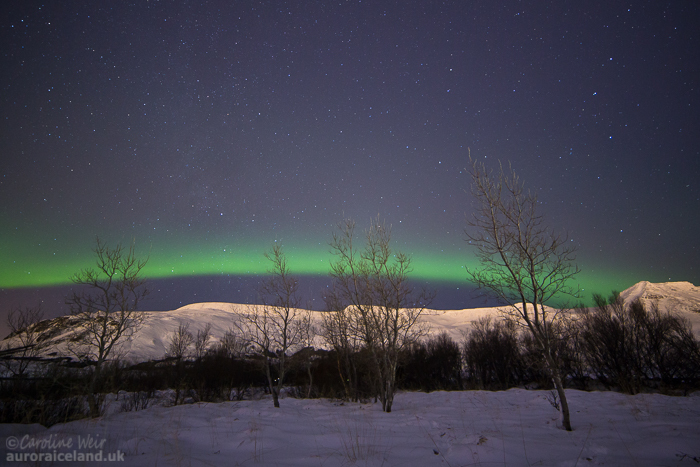 A homogeneous band of aurora above the mountains. Some faint purple along the top suggests this aurora is starting to develop more structure. Multiple fairly uniform homogeneous bands of aurora extend across the sky. Homogeneous bands, showing fairly uniform appearance. These auroras occur in similar arc or ribbon forms to the homogeneous auroras described above, but rather than being uniform they consist of multiple rayed vertical structures that move over time. In arcs, the rays may flicker east to west horizontally along the arc, while in rayed bands there are often multiple irregular curtains of rays that curve and "dance" over time. 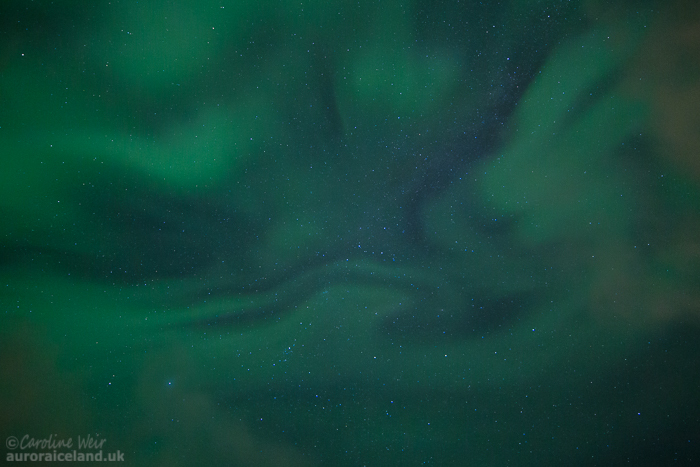 During strong auroras the curtains can move very quickly, forming extensive curves across the sky. 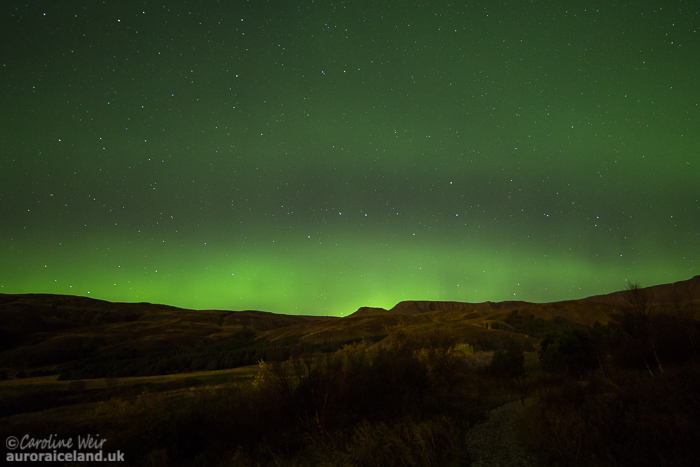 These rayed auroras are typically a vivid green to the naked eye, but can also take on various colours. It is common in intense rayed curtains and arcs for the lower fringes of the rays to have a bright pink colour, while the tops of the rays may be a deep reddish-purple. Curtains of rayed bands of aurora. Rayed bands with tall rays and purple tops. Swirls of rayed aurora bands dance across the sky. A rayed aurora band from below looking almost directly upwards. In Iceland I see striated auroras very regularly. They usually comprise a thick swathe of aurora consisting of multiple distinct narrow vertical stripes of aurora that are interspersed by clear sky. They extend vertically upwards from the eastern or western horizon, and (usually) diminish into a narrow diffuse band once directly overhead. Normally the striated aurora is concentrated in one direction and appears only weakly in the opposite direction. They tend to stay in one particular area for a prolonged period, or to shift only very slowly over time. To the naked eye the striated auroras are usually white (when weak) or shades of green (usually paler shades). However, areas of pink fringe may be visible on camera. Striated aurora - a rather weak and wide example. Striated aurora - moderate intensity. Striated aurora - a very typical example. Auroras can occur in rayed bands as already described. However, vertical rays may also occur singly, or as defined and distinct clusters. Often these rays are independent from the main aurora structures, and may appear and disappear quickly. They can be anywhere from low on the horizon to directly overhead, but in Iceland I most commonly see discrete rays or ray clusters in the mid-sky. To the naked eye they may be any colour from white, yellow-green or green, and on camera they sometimes have red or purple ray tops. Isolated vertical rays hanging in a moonlit scene. Distinct clusters of rays often occur alongside other types of aurora. Coronas are doubtless the result of perception rather than representing a distinct type of aurora. When some forms of aurora such as rays or rayed bands move overhead of an observer's location, the perspective of looking directly upwards causes them to converge to a point to form a crown or "corona." The corona is widely considered to be the most impressive type of aurora, and they occur during strong overhead activity associated with the most spectacular aurora displays. They are often fast-moving and relatively brief in nature, but occasionally the corona can remain for longer periods. To the eye, the converging tall rays are often bright green and regularly contain pinks and purples depending on intensity. A beautiful corona viewed from the side. Looking directly upwards into a corona. Pulsating auroras are a distinct type of aurora that I have observed on multiple occasions following a really intense and strong burst of activity (i.e. rayed bands and corona). Often, such intense and structured auroras "burn out" at the end, such that their structure becomes less distinct and they expand to cover wider areas of the sky at lower-intensity. On these occasions I have seen the aurora take on a form that comprises rhythmic pulsating (appearance and disappearance in the same place) of multiple small patches of light, usually appearing white or very pale green to the naked eye (but various shades of green and even with pink fringes on camera). The patches can form and dissipate very rapidly in intervals as short as 1 second, such that they look like flashes. On other times they are a bit slower and it is possible to watch them appear and disappear over a few seconds. 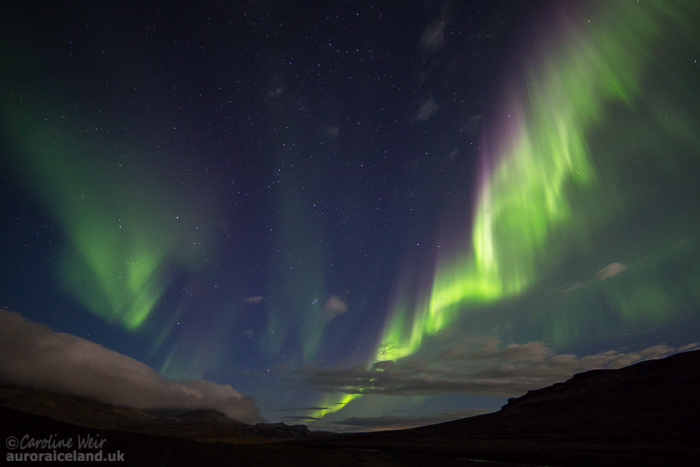 It is easy to miss these pulsating aurora patches which appear cloud-like except for their constant flickering. Rapidly-pulsating aurora, showing pink fringes on camera. 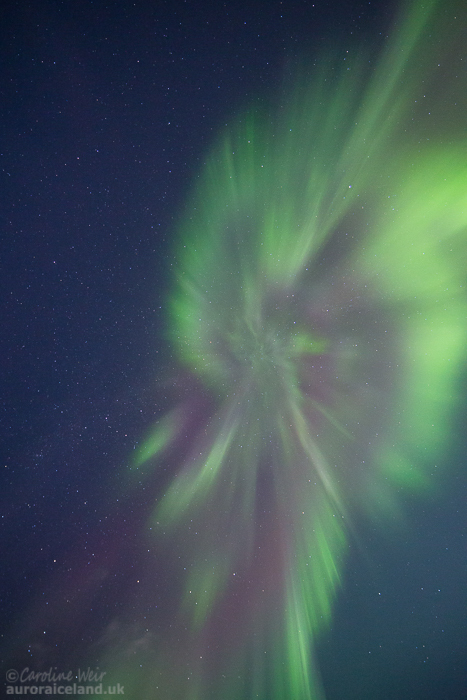 Looking directly upward into a pulsating aurora. Similar to the pulsating aurora, this type of aurora also seems to be often linked with the end of a period of strong and defined activity, occurring after the main curtains have expanded to cover much of the sky in a less structured form and at lower intensity. The veil aurora consists of a wide uniform area of diffuse pale light, without obvious structure or movement, and covering a wide expanse of sky. It is usually a faint white or pale green to the eye, but can be a stronger green and comprise more defined patches on camera. A veil of diffuse green aurora across the sky. A diffuse veil of aurora covers much of the sky in this image.